Mine to coast; the journey of Tunisian phosphate from Gafsa to the fertilezers production plants on the coastal area of Gabés. From 1972 onward, several phosphate fertilizer plants have been built in the industrial complex of Gabès, exploiting the resources of the Gafsa mines. This complex offers many jobs for this region, which suffers from a high unemployment rate . Nevertheless, in 2013, after the death of two children from diseases caused by radiation, protests began in order to demand the reduction of phosphate pollution in the Gabès District . Civil protesters also organized Internet campaigns on Twitter and Facebook in order to inform the population and try to negotiate with the government . 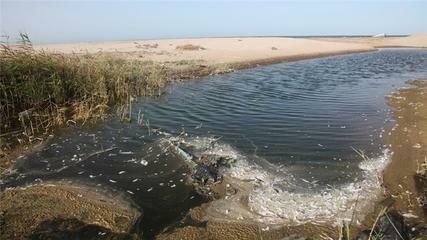 The phosphate fertilizer plants in Gabès have deeply impacted the environment of the region. First of all, the 12,000 tons of phosphogypsum drained into the gulf everyday cause damage to the marine fish biodiversity and the interdiction of bathing, because radiation levels are too high . Moreover, soil and air pollution impacts human health . Even if no study has precisely estimated the health consequences, local protesters denounce the rising infertility, the increasingly common miscarriages , and the appearance of several diseases such as asthma, cancer, and hepatitis . While Gabès gulf is in the UNESCO World Heritage tentative list , pollution has degraded the landscape too. The sea color is brown. The air does not smell good because of acid smoke. Palm trees of the oasis are dying because of water pollution and shortages due to the overconsumption of the fertilizer plants . These risks have been well known from the beginning of the project . Nevertheless, because of the social and economic importance of the complex, the political will to end the pollution seems very limited. Why? Explain briefly. The Ministry of Environment and Sustainable Development and the Tunisian Chemical Group have planned the building of a landfill site (far away from Ghannouch, around 20 to 40 km away) for the phosphogypsum which is currently drained away into the gulf. Nevertheless, inhabitants of this site have declared their disagreement with this plan. Moreover, because of economic reasons, the closing of the industrial complex is not planned, nor has any solution for limiting human health impacts and the degradation of the landscape been proposed.